I have run across many posts in the recent past explaining varied uses for Wordle in the classroom. (See this post from the Tech Savvy Educator, and this one from Clif’s Notes for some examples that come to mind.) While I appreciate the springboards that these many examples provide, I did notice that most posts collect many ideas together as opposed to describing the use within the context of a specific lesson design. Below, I describe the process my students used as an assessment for whole-class learning in my physics classes, where Wordle played an integral part. I hope that making my practice public can inspire each of you to improve on what I’ve tried- every time one of you shares how the lesson design works in your own classroom, we get a new opportunity to grow and learn from each other! This cloud gives the class a picture of what ‘we’ think in relation to magnetism. As the last conversation was a “class-ending” conversation the day before, the word cloud became a “class-starting” conversation the next day. We began class by examining this word cloud, questioning what it was that we would likely want to learn next about magnetism. 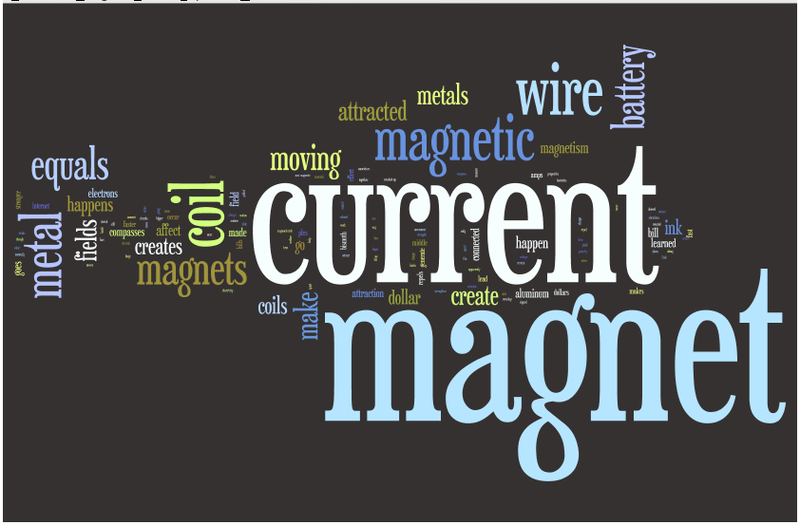 By taking the student responses and pasting them into a Wordle, we were able to see what “we” now think about magnetism. As a class, we compare this new word cloud to the first Wordle: by analyzing the similarities & differences between these two Wordles, the class is now examining what we have learned, and how our thinking has changed. The unintended consequence- many students noted that our new responses went farther down the path of “induced” magnetism (that is, magnetism brought on by electric current), and farther away from the more typical concept of naturally magnetic materials. They wondered how we would connect these two ideas, as they still seemed disconnected in our thinking. This connection just happened to be the planned topic of study for the day, not only because it was part of our original pacing guide, but specifically because now we have noticed this trend in the “data” that the Wordle had presented. The students noticed that the dots were not connected, and the students wanted to connect them, which made the day’s learning much more authentic. It was not just something I was supposed to teach them: it had become something that they wanted to learn. Have you used Wordle as a class assessment for learning with your students? Please share ideas, questions, and suggestions in the comments. If you decide to try out this lesson design with a topic in your class with your students, please consider sharing how it goes in the comments- learning from your experiences helps us all grow!